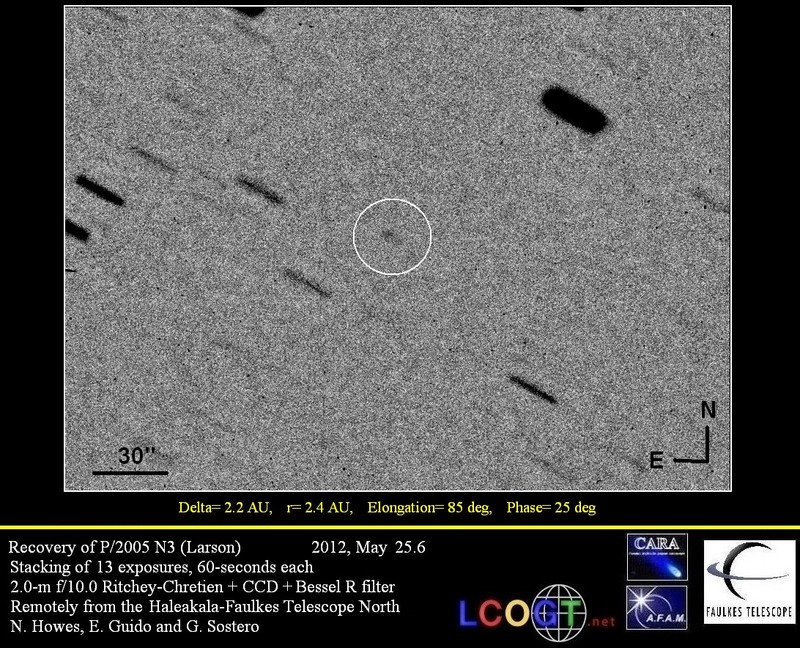 The IAU Circular nr.8979, issued on 2008 Sept. 24, annouces the discovery of a new comet: P/2008 QP20 (LINEAR-HILL). 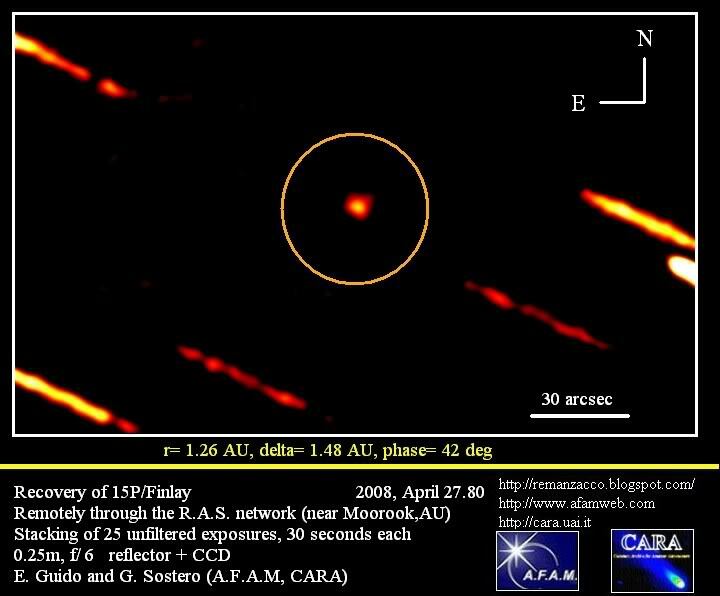 This object has been picked-up in Aries by R. E. Hill through the 0.68-m Schmidt telescope of the Catalina Sky Survey on 2008, Sept.23.3, and afterwards linked by K. Smalley (Minor Planet Center) with an object discovered by the LINEAR sky survey on 2008, Aug. 25.4. Hill's discovery report describe this 18-th comet as having a well condensed coma about 6 to 12 arcsec in diameter, and a narrow tail up to 4' long in PA 250-260 deg. The preliminary orbital elements published on M.P.E.C. 2008-S48, points toward a Jupiter-family comet (a~ 3.5 AU, e~ 0.5, i~ 8 deg, P~ 6.5 years); perihelion will be reached at the beginning of November 2008, at about 1.7 AU. The maximum brightness will be reached at the end of next October, at about magnitude 17; it will mostly remain a northern object. 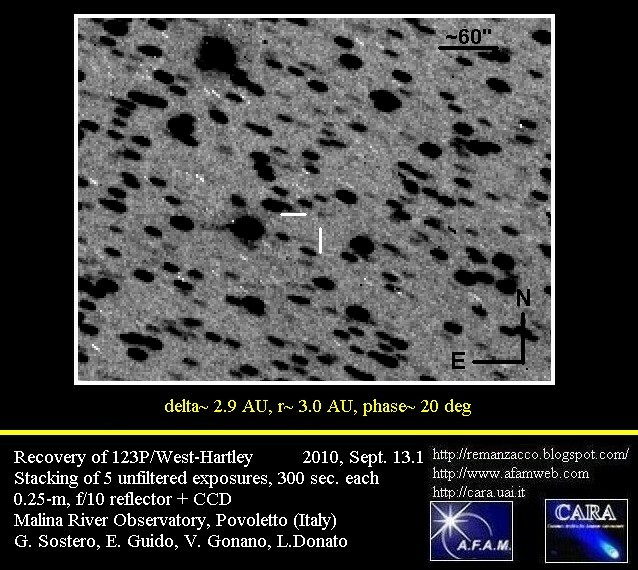 IAUC nr.8977, issued on 2008, September 19, announces the discovery of a 17-magnitude comet by R. H. McNaught about 2.5 deg. northwest of Antares (Alfa Scorpii). It was described by the discoverer, and afterward by several astrometrists that perfermed confirmatory follow-up, as having a coma about 8 to 30-arcsec in diameter, with an extension (tail or elongated coma) 10 to 20-arcsec long toward North-East. 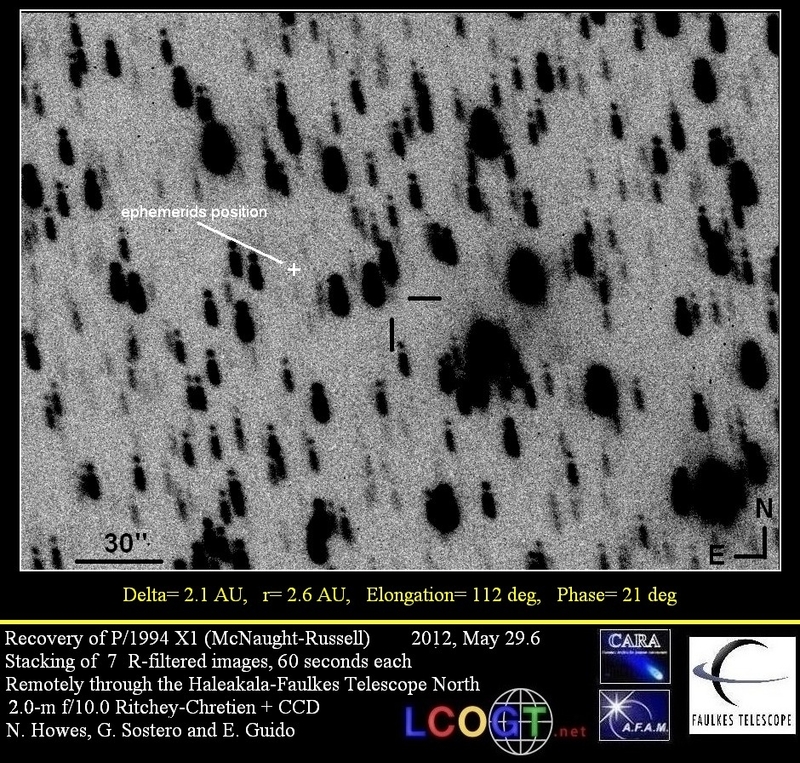 IAUC nr.8973, published on 2008, September 8th, announces the discovery by the LINEAR sky survey, of a new comet, named C/2008 R3 (LINEAR). It has been found in Hercules on 2008, Sept. 7 at about magnitude 18; several observers performing its follow-up, found signs of cometary activity (coma diameter ranging from 8 ti 13-arcsec, tail of 15 to 20-arcsec toward PA about 130-deg). Initially we observed it with the 0.30-m f/5.8 reflector at Trunkey, N.S.W., Australia, on Sept. 8.44-8.48, obsering a small coma about 12-arcsec in diameter. 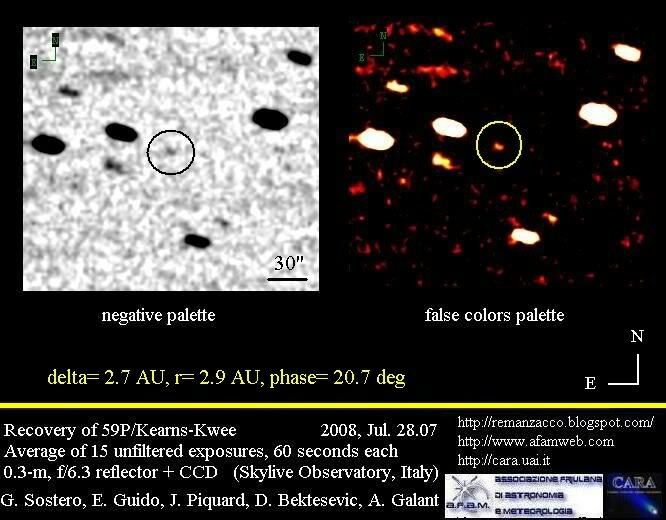 Further observations were obtained on 2008, Sept. 8.8 through a 0.45-m, f/4.4 reflector + CCD at the Remanzacco Observatory (Italy), where a deep stacking showed the presence of a coma and a broad tail toward South-East. Preliminary orbital elements from the Minor Planet Center (http://tinyurl.com/4577dd) assumes its orbit as parabolic, with an inclination of nearly 43-deg. Perihelion will be reached in November 2008, at r about 1.9 AU from the Sun. This comet is expected to reach a maximum magnitude of about 17, at its perihelion. IAUC Circular No. 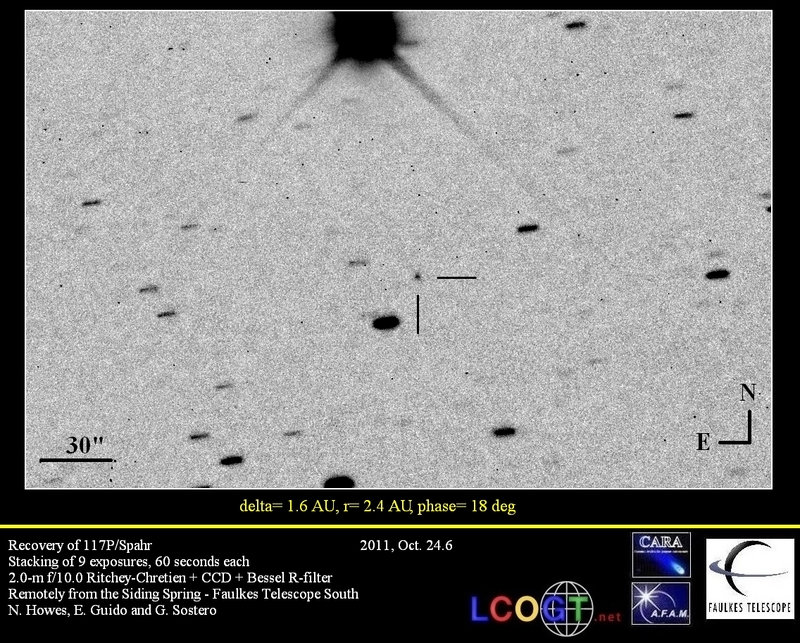 8969, published on 2008, Sept.4, informs that Gordon Garrad discovered a comet in the southern constellation of Grus, named C/2008 R1 (GARRADD). 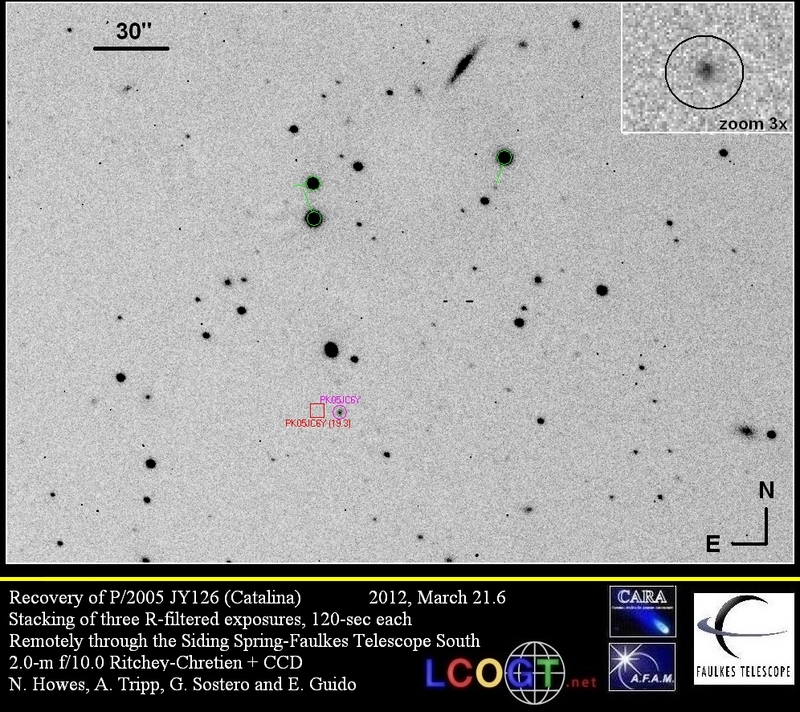 This object has been found on 2008, Sept. 2.5 through the 0.5-m schmidt at the Siding Spring observatory (Australia). The Electronic Telegram No. 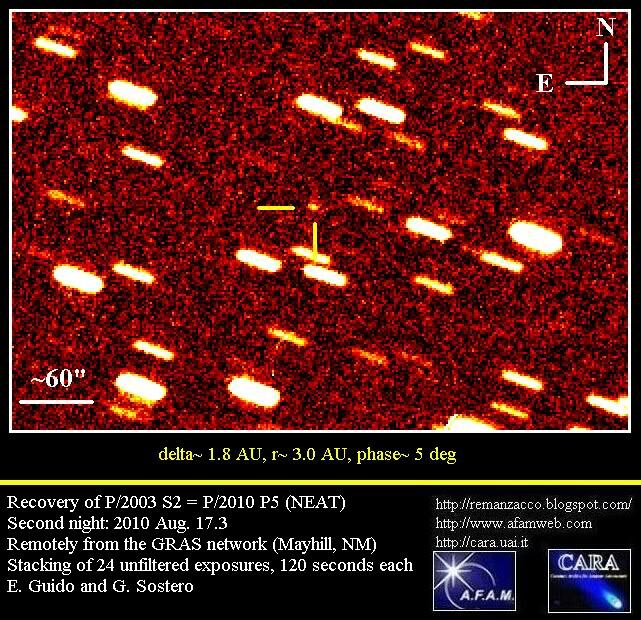 1490, published by the CBAT on September 1, announced that M. Jaeger (Stixendorf, Austria) recovered P/2001 R1 (LONEOS) on 2008, Aug. 31.08719. He described the object as having a small coma and a tail about 3' in PA 275 deg. After reading a comment of Jaeger, posted in the newsgroup [Comets-ml] about his recovery of this comet, we performed some follow-up observations of this object, remotely from Pedara (Italy) through the "Skylive" 0.3-m, f/6 reflector + CCD. Co-adding of 14 unfiltered exposures, 120 seconds each, obtained on 2008 September 1.1, showed the presence of a small coma, nearly 10 arcsec in diameter, of about magnitude 16.8, and a tail nearly 40 arcsec long, toward PA 280 deg. M.P.E.C. 2008-R06, published on 2008, September 1, announces the recovery of 145P/Shoemaker-Levy. This periodic comet has been recovered by the Siding Spring observatory on 2008, Aug 04.55491 and 26.56107. 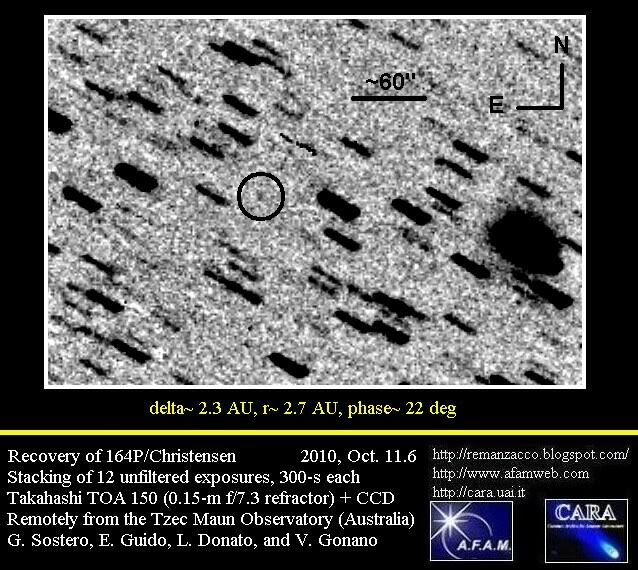 We performed some indipendent observations of this object in the course of our own search for its recovery, along three consecutive nights (2008, Aug, 26.54329 to Aug. 28.57171) remotely, through a 0.30-m f/5.8 reflector + CCd of the Skylive-Grove Creek Observatory (Australia). In our stackings the comet appears as a featureless, stellar object, about magnitude 19, slowly moving in the southern constellation os Microscopium. Following the posting on the Central Bureau's unconfirmed-objects webpage about a possible nova in Sco, on 2008 Sep. 3.45 we performedsome follow-up of this object remotely, from Moorook (Australia),through a 0.1-m, f/5 refractor + CCD. R.A. = 17h57m32s.93, Decl. =-30o43'10".3 (equinox 2000.0; UCAC-2 catalogue reference stars). Comparison with an archive UK-Schmidt Red plate (obtained on 1992,June 03) show no counterparts at this precise coordinates; a nearbyfield star, with position end figures: 32s.95, 08".1, has magnitudeabout 18. 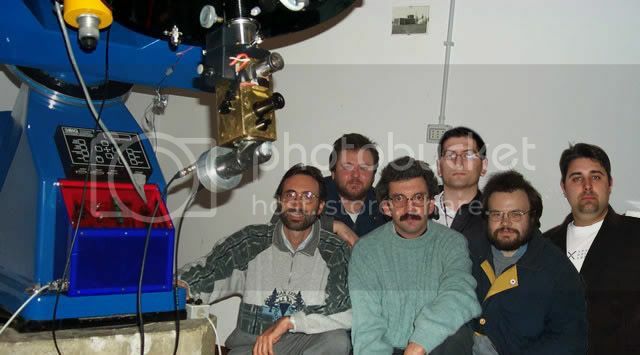 Following an alert note of Grzegorz Pojmanski, Dorota Szczygiel and Bogumil Pilecki of Warsaw University Astronomical Observatory, about their discovery of a possible nova in Centaurus at coordinates: A.R.= 14h 35m 03s; Decl.= -64o 06.4', through the ASAS3V instrument of The All Sky Automated Survey, we performed some follow-up of this object, remotely from the Skylive-Grove Creek Observatory (Trunkey, Australia). R.A. = 14h35m02s.54, Decl. 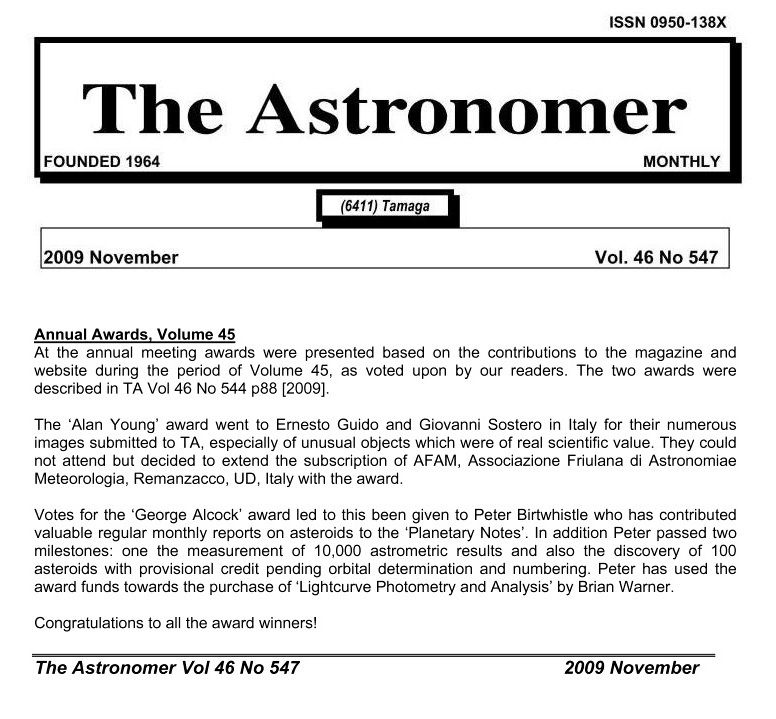 = -64o06'20".0 (equinox 2000.0; UCAC-2 catalogue reference stars). Comparison with an archive Poss-2 Red plate (obtained on 1991, Jul.17) and with a Poss-2 Infrared plate (obtained 1981, Mar.02) show the presence at this coordinates of an extremely faint optical counterpart, at the detection limit of the plate. These are the results of our multicolor photometry (comparison stars HIP_71437 and HIP_71400): 2008, Sept. 2.39: B=9.54, V=8.63, R=8.03, I= 7.42; Sept. 2.46: B=9.69, V=8.70, R=8.10, I= 7.60 (accuracy about 0.05 magn. in each color). An estimation by P. Camilleri (Hurstville, NSW, Australia) performed on 2008, Sept. 2.48, through a 20x80 binocular, provides a visual magnitude of 8.4.